Five-year-old Brianna Hamilton completes the biker obstacle course alongside a Fulton PD bike officer. (Left to right) From the Fulton Police Department: Lt. Burlingham, Officer Blasczienski, Sgt. Lunn, Officer Howard, Lt. McCann, Officer Tetro. 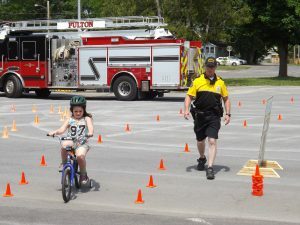 FULTON, NY – For more than 15 years the Fulton City Police Department has emphasized bike safety at its annual Bike Rodeo. Like years past, children of any age were welcome to complete the bike obstacle course at the Fulton War Memorial on Saturday (June 4) and enter their ticket in the raffle for a brand new bike as donated by Catholic Charities and Dunkin Donuts. 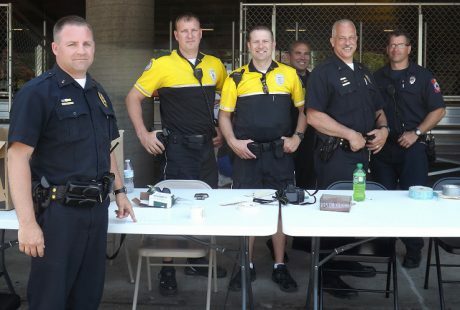 However, as the event has continued to evolve from its humble start, more community agencies have joined in and made the Annual Bike Rodeo a family fun event that also provides safety education. “The Bike Rodeo is a way to bring community organizations together and also offer the children of our community bike safety lessons,” said Fulton Police Sgt. Steve Lunn. 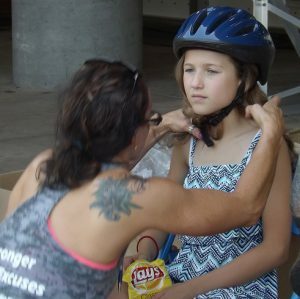 This year, Fulton Police were joined by Oswego Health offering free helmet fittings for children to receive their own properly fitted helmet for free as well as Tracy Doyle of Doyle’s Bike Shop present to tune up the bikes that were brought and even offered free refurbished bicycles for those that don’t have one. 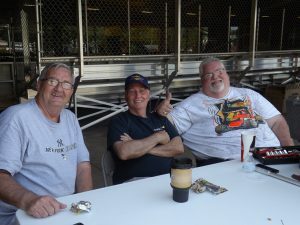 (left to right) First Ward city councilman Thomas Kenyon; Second Ward councilman, David Ritchie and Tracy Doyle of Doyle’s Bike Shop were present at the FPD annual Bike Rodeo. “They went quick!” said Doyle of the free bikes, adding that some people were lined up right at the start of the event looking to take advantage of the opportunity to provide their child a bike who may otherwise not have the opportunity to have one. The Fulton Police Department was on hand to register bikes as needed also. “That’s what this is about, providing these resources in one area so everyone has the opportunity to utilize them,” said Sgt. Lunn. Inside the Fulton Community Ice Rink, the fun continued. Menter Ambulance was on site providing an inside look at an ambulance and warm weather safety tips; the Oswego County Sheriff’s Department offered the opportunity to participate in Operation Safe Child, making an ID card for children; Fulton City School District offered Pre-K and Kindergarten registration and free books; the Child Advocacy Center offered free crafts, books and anti-bullying T-shirts; Head Start Pre-K offered registration and free bubbles and stickers for children. 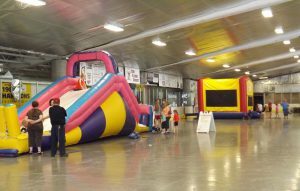 inside, children could enjoy the bounce houses and utilize community resources. And just when the children thought the bike riding fun and free goodies was all the event had in store, they were able to play in two giant bounce houses before enjoying some free donuts as provided by Dunkin Donuts and free hotdogs, chips, water and juice as provided by Fulton Rotary PBA, cooked and given out by volunteers from the Fulton Alliance Church. All of these community organizations came together for the overall goal of encouraging bike safety for the youth of the community, to ensure they can properly and safely navigate the city when on two wheels. The bike obstacle course outside was set up to simulate real life situations that may occur when a child is out on a bicycle. Lunn explained that the course started in what imitated a driveway where before starting the course, a Fulton Bicycle Officer would explain to the young cyclist the safety precautions that should be taken throughout the course as well as explaining hand signals and the importance of safety gear. Rylee Bartlett gets a free helmet properly fitted by Oswego Health. The course featured obstructions such as oncoming vehicles, stop signs, cones and a narrowed area of the course to simulate a sidewalk. It also featured simulations of potholes, old style drain grates, debris in the road and more to give the course an even more real life approach. “We tried to put as many simulated experiences that cyclists could encounter as we could in our small course to stress the importance of avoiding the obstructions, use of hand signals and obeying the traffic regulations,” said Lunn. The event concluded with the raffle for three brand new bicycles and with plenty of happy, well educated young cyclists ready to safely ride this summer. Brand new bikes donated by Catholic Charities and Dunkin Donuts were raffled during the annual Bike Rodeo. 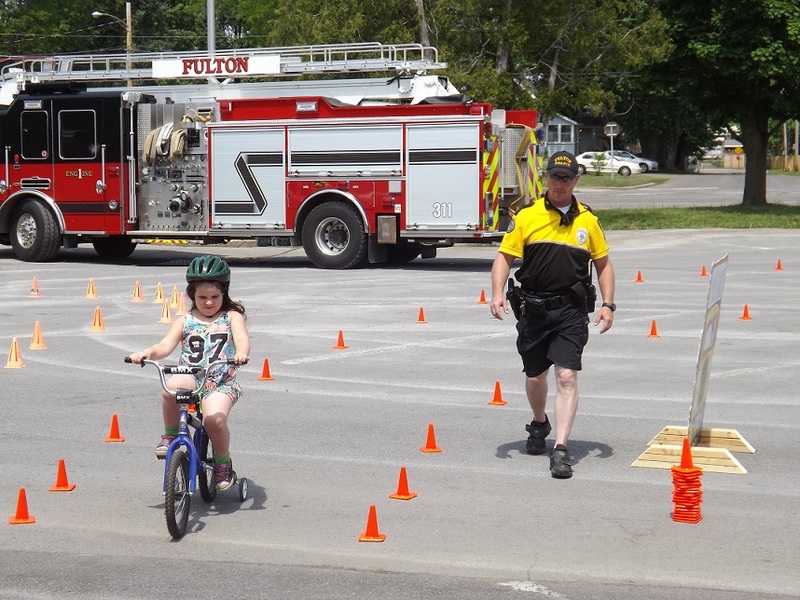 For more than 15 years, the Fulton police Department has hosted their annual Bike Rodeo to educate young cyclists on bike safety. A Fulton Police Bike Officer teaches a young rider before guiding him through the obstacle course.